Compact and versatile 5X standard zoom lens with f/4 maximum aperture Perfect for landscapes, portraits, weddings and distant subjects offering a constant maximum aperture to maintain exposure settings throughout the entire zoom range and VR II Image Stabilization. 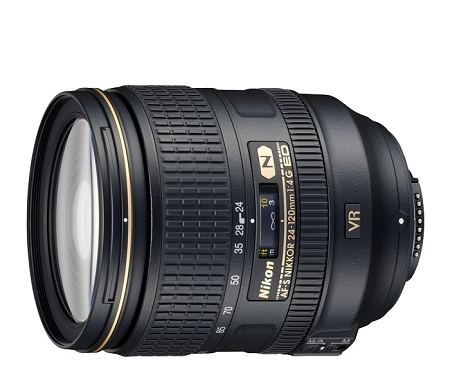 Nikon VR II (Vibration Reduction) Image Stabilization Vibration Reduction, engineered specifically for each VR NIKKOR lens, enables handheld shooting at up to 4 shutter speeds slower than would otherwise be possible, assuring dramatically sharper still images and video capture. Nano Crystal Coat Further reduces ghosting and interior flare across a wide range of wavelengths for even greater image clarity. Exclusive Nikon Silent Wave Motor (SWM) Enables fast, accurate and quiet autofocus. Internal Focus (IF) Provides fast and quiet autofocus without changing the length of the lens, retaining working distance throughout the focus range.